Rather sketchy, don't you think? I am currently undergoing a sprite project. However, for it to be successful I need your help. I am pretty much only looking for one specific sprite for each character. 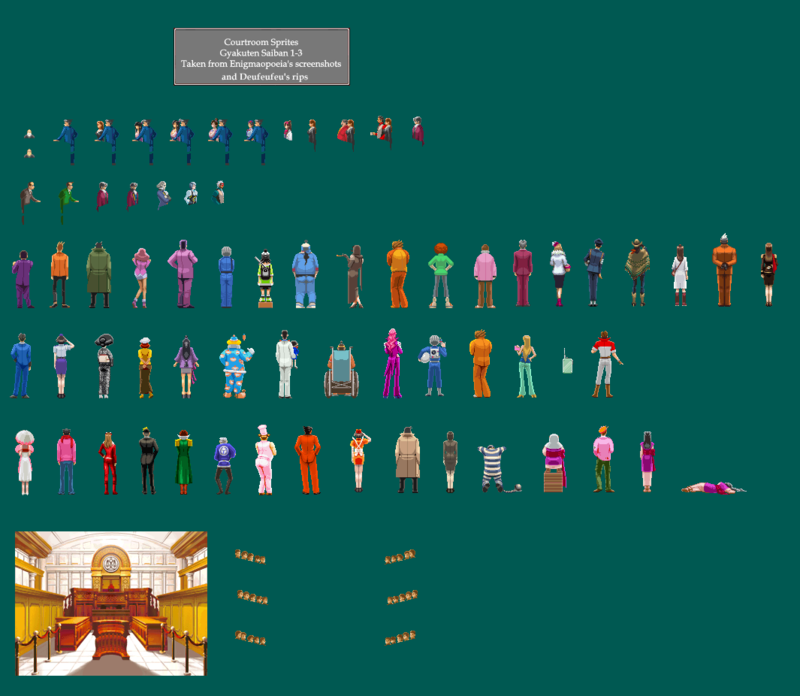 The sprite I am looking for is the sprite where the character would be standing behind the witness stand, and you can see the entire court from there. For instance, whenever you start a new sub-chapter in trial, you could start out all zoomed out to see everyone. Many of sprite sheets lack this. Also, I am looking for one specific background that shows up in Phoenix's nightmare. You know, the one where the Judge is all possessed and holding a huge hammer? I need that too. My e-mail address is voltz00@hotmail.com. Again, I know this is a big request, but if you could help in any possible way, even just a bit, I will be thankful! Now all I need is the possessed judge and the case 5 witnesses and I'm all set. Wow, I was wondering what you were gonna do with them. Your avi looks awesome!